John Halligan provides us a much-needed sense of urgency to developing home-school partnerships: Saving lives. In 2003, he lost his 12-year-old son Ryan to suicide after he was bullied and cyber-bullied by his peers over a period of time. Since then, his courageous father has visited over 650 schools to speak to students, teachers, parents, lawmakers, administrators and community members. He speaks not only about the horrific events that took place on October 7, 2003, but how he and his wife tried to help Ryan along the way. Mr. Halligan speaks from the heart with hindsight on explicit details directed toward parents and school officials on what to do and what not to do during a bullying situation. I had the opportunity to hear him speak recently. While he spoke, I listened through my principal lens. What could I learn from him? What could I take back to my students, staff and parents to make sure there wasn't another Ryan's Story to speak of at my school? 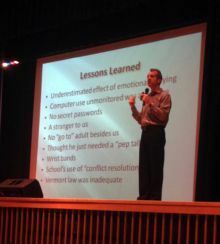 Mr. Halligan appeared to me as an engaging teacher, educating from experience to those in attendance on the symptoms and statistics of youth depression, the definitions of bullying and cyber-bullying, and a summary current laws in place to keep kids safe on the Internet. He commended several bully prevention programs, particularly giving credit to those who activated the bystander. We need to take these words seriously. The partnerships that schools develop with parents before, during and after the school year must be two-way, transparent and always in the best interests of the child. Parents and teachers won't always agree with each other's input, but each distinct yet important perspective is needed to help the child move forward in the healthiest way possible. Schools and parents must be proactive. Don't wait until a bullying situation or youth depression development is in progress before developing these important partnerships. Invest in the relationships necessary to work your way through any student challenge that might arise. As I listened, I also tweeted about the more thought-provoking ideas. See the Storify page I created, John Halligan tells Ryan's story. The following two "Ryan's Story takeaways" were written by a parent and a teacher from the audience. It is necessary for me as a parent to go to presentations like John Halligan's. They remind me to address issues with my children that are outside of my comfort zone. It was very powerful how, in addition to the usual (cyber) bullying and child depression definitions/signs, John spoke candidly about the lessons he learned the hard way. Youth depression isn't discussed very often. It was scary to see the numbers up on the screen of just how many of our children have felt so sad that they have thought about and/or attempted suicide. You always hear about how important it is to keep an open line of communication with your children. John addressed how, in reality, there is going to be a time when our children may not feel comfortable telling us something -- so be sure to have them create a list of three "go to" adults. Someone they can talk to about an issue going on in their lives. If you feel your child is depressed or thinking about suicide, address it straight on without judgment or attitude. It isn't going to put suicidal thoughts into their heads, but may prevent them. After asking, be prepared to call the pediatrician or go to an emergency room if they are. At times, the reason for the depression/suicidal thoughts is from being bullied. We need to teach our children to be "upstanders," not "bystanders." They need to speak up when they see someone mistreating someone else (before it's too late). Suggesting that they text or email that person if they're uncomfortable doing it in person. And as a parent, we need to teach the importance of practicing what we preach. This, to me, goes along with teaching them what it means and how to be good, respectful, model citizens. I had the privilege of hearing Mr. Halligan articulate a vulnerable yet cogent message about bullying. As a teacher, Mr. Halligan's presentation impressed upon me the corrosive power of words and their ability to erode our students' self-esteem. It reinforced, for me, the importance of intentionally and painstakingly creating a classroom environment of tolerance. To this point, it is not enough to pay lip service to lofty ideals of acceptance, but rather we need to actively engage in role playing, communicating effective ways to ask for help, and validating feelings. Mr. Halligan stresses the dangers of assuming that students know how to ask for help. He points out that the brain is not fully developed emotionally, physically or socially, and consequentially needs both information and practical application in order to acquire authentic understanding. Additionally, the most effective ways to deal with bullies and their victims is not through conflict resolution, which aims at creating a level playing field between two individuals engaged in a disagreement. Bullying is an imbalance of power. Rehashing the traumatic events can further victimize the victim and negates genuine consequences. While empathy certainly needs to be developed, privileges need to be taken from the bully in order to demonstrate the seriousness of the issue. My final takeaway is an acknowledgement and acceptance of the power I have to facilitate positive behaviors via modeling and strategic planning. A strategy I found particularly promising is reaching out to bystanders, especially the friends of a bully. They are in the best position to effectively change the bully's behavior. They can do so in a private way, which conveys to the bully that their actions are not acceptable. Reaching those bystanders who have the ultimate influence on bullies appears to be a pragmatic way to apply positive pressure on bullying behavior.